Australian lure company Halco has been manufacturing lures in Western Australian since 1950. Their range of products include iconic lures like the RMG Scorpion, Halco Laser Pro, Twisty and many more. There would be a Halco lure in most keen anglers’ tackle boxes. After many years of being at the forefront of hardbody lure design, Halco have dipped their toes in the water in the soft plastic side of things with their Madeye soft plastics. As you would expect, the company has developed this range with the same vigour and quality that they have done with their hardbody lures. They have six styles in the Madeye range, and I grabbed four of them to test out for the magazines. The Madeye Paddle Prawn has a sensational action and the flathead loved them. 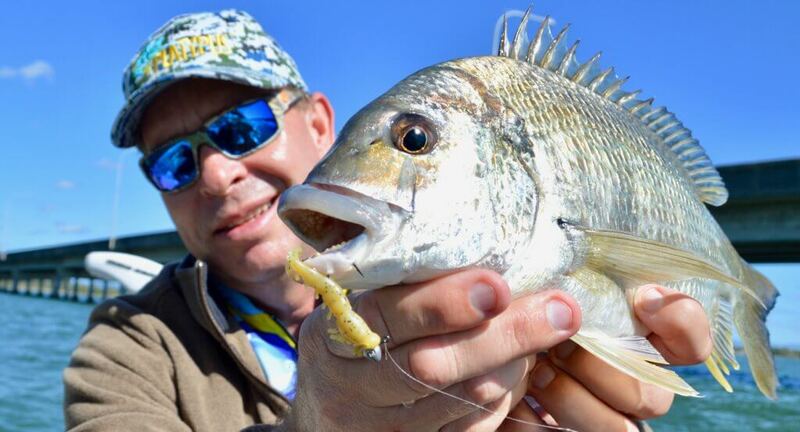 The range of Madeye Plastics covers the full spectrum of soft plastics fishing from finesse styles for bream and whiting through to deep water jigging with larger offerings. The six styles of plastics are the Paddle Prawn, Flick Stick, Octoskirt, Flutter Shrimp, Whippy Worm and Mad Craw. 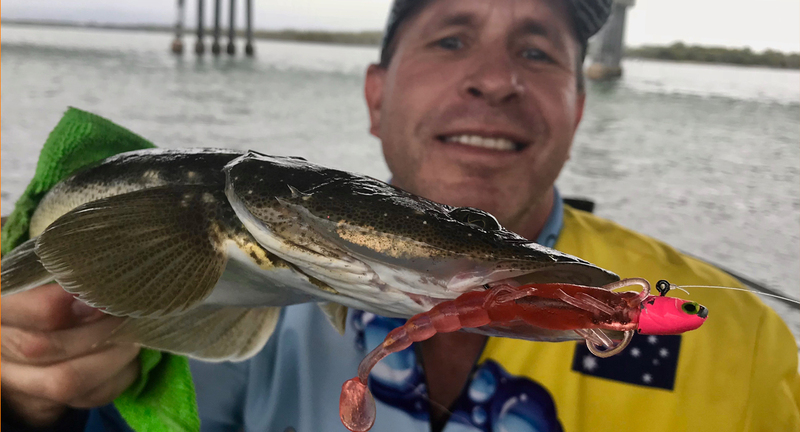 These days most anglers expect their soft plastics to have substantial longevity, and Halco has achieved this with their Rubber Stretch Technology (RST). The copolymer material that the plastics are made from has up to five times the durability of a regular soft plastic, and it is also incredibly buoyant. The advantage to the angler with this is that pickers are less likely to destroy your plastic before your target species has a chance to have a crack at it, and if pickers do attack the plastic they are less likely to render it unusable. The buoyancy also adds to the natural look of the lure; it sinks in a realistic manner, and at rest it sits upright and has a natural movement to attract predators. 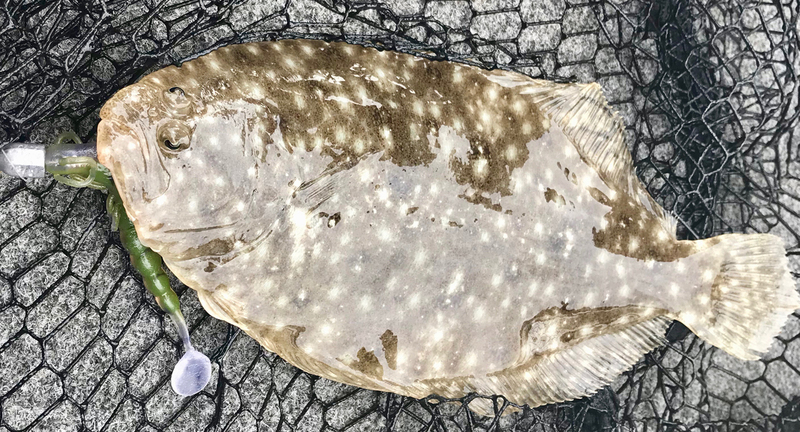 Flounder are a welcome bycatch. This one took a Paddle Prawn in the raw prawn colour. 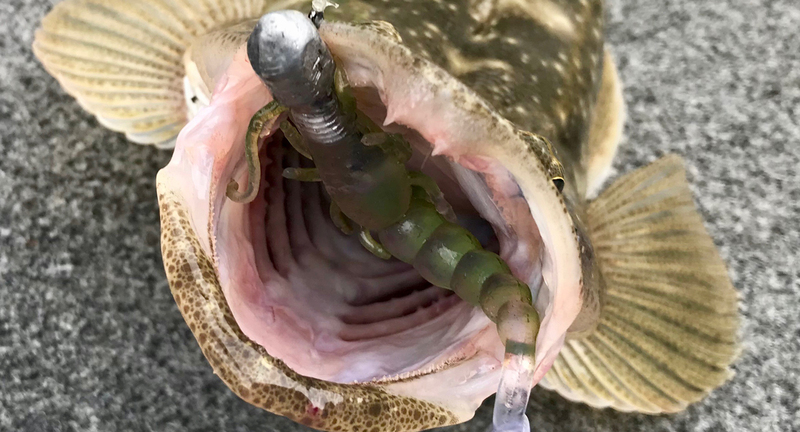 The Mad Craw is a lifelike yabby imitation that is 2” long. The attention to detail in this plastic is second to none, right down to the fold in the tail of the yabby. The Mad Craw comes in four colours, of which I grabbed three – the jelly prawn, salt and pepper, and marron. My first intention was to use these lures to target bream. These fish love what many people would call a creature bait, and the Mad Craw fits into this category. 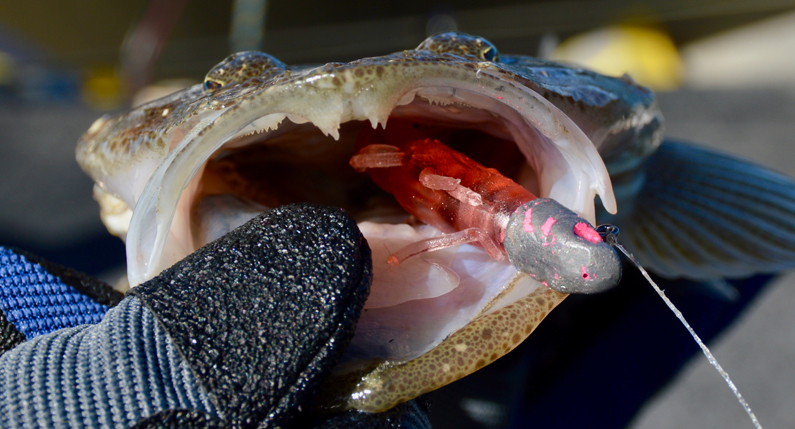 During my testing, the bream definitely took a liking to the Mad Craw. The various legs and claws provide plenty of movement, and most of the bream caught grabbed them as the lure was dropping. I guess they had to, because if their prey did reach the bottom there was every chance a flathead would grab it before the bream had a second chance. No complaints here, but you will note in the images that the flathead didn’t mess about. On a side note, it is really surprising just how buoyant these plastics are. I would normally use a 1/24oz jighead in the areas we fished, and had to up it to a 1/16oz or 1/12oz jighead depending on the current. Also, I found that a small drop of super glue on the grub keeper helps reduce the plastic slipping down the hook. As well as chasing bream, I can also see me using these lures chasing trout in the lakes and the rivers. What trout can resist a yabby if it’s on offer? The unexpected bonus when fishing the Mad Craw was how much the flathead loved them. There is a marron-colored Mad Craw in there. 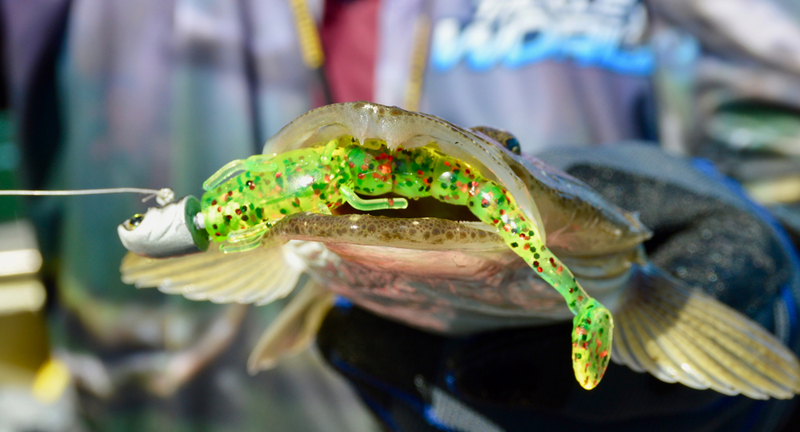 The next plastic I tested was the Flutter Shrimp. This small prawn imitation is pretty much the opposite of the Mad Craw in that it has a simple design – a traditional prawn profile with a small curly tail. It is available in five colours and is 2.5” long. I grabbed the jelly prawn and coffee’d shrimp colours. 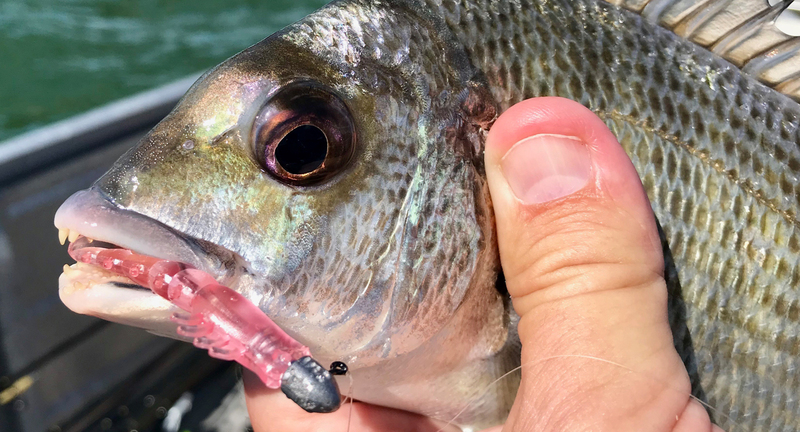 When the plastics arrived I was most excited to see the Flutter Shrimp, because small curly tail plastics have been the undoing of many species of fish, especially the bream I wanted to target with it. I was a little surprised by the smaller profile the Flutter Shrimp had (I had pictured something a little less finesse), but was stoked with the colours I had chosen. They were spot on. Like the Mad Claw I used slightly heavier jigheads and targeted bream around man-made structure and across the flats. I was met with instant success, and was immediately wondering why I hadn’t gone to this lure first. While hopping it across an open area with structure nearby, I scored the biggest bream I have caught in some time. It went nearly 40cm to the tip, which is a solid fish for the area. Both colours were effective and, unlike the Mad Craw, super glue wasn’t a necessity when rigging them. The plastic still slips, but mainly due to a fish grabbing it, rather than it moving by itself. The jelly prawn coloured Flutter Shrimp was the downfall of this bream. When it comes to the Paddle Prawn, there is a lot going on. It is available in four sizes (3, 4, 5 and 7”) and has up to seven colours, depending on the size. The profile of the plastic is a prawn-style head with legs and feelers attached to a body that tapers back to a paddle tail. The wrist of the tail is thin, maximising the action. I chose to use the 4” version, and picked the ivy flash, jelly prawn and raw prawn colours to test. The Paddle Prawn was the surprise packet of the plastics tested. You cannot understand how much movement this plastic has until you rig it and get it into the water. The tail has a very strong movement, as you would expect, but it is the body roll that is awesome. The vibration this plastic produces can be felt with every movement of the fishing rod and wind of the reel. During testing the target species was flathead, and it was no surprise that they took a liking to the Paddle Prawn. Fished on a 3/8oz jighead, you can use a hop or slow lift retrieve. It was extremely effective during the slow movement periods of the tide, when the action of the lure really came to the fore. When there was a lot of flow, the buoyancy and action of the lure means it grabs too much water, moving the plastic more than you would like. A simple adjustment to your retrieve helps keep it in the zone and catching fish. All three colours were effective, but I need to make special mention about the raw prawn colour. It looks fairly plain in the packet, but the clear UV belly provides added appeal, and if the fishing is tough I believe that UV makes a difference. Paddle prawn in raw prawn colour does it again. The Flick Stick is the most traditional of the profiles in the Madeye range. It has a largish body that tapers to a long tail. Available in three sizes (3, 5 and 8”), it is a baitfish imitation and comes in up to seven colours depending on the size of the lure. The model I tested was the 5” version. The beauty of a plastic with this profile, is that with its streamlined design is it gets into the strike zone faster and stays there better during a retrieve. The trade-off for this is that the angler needs to impart the action to the lure. This is the case with the Flick Stick, however with the suppleness of the tail there is some movement, which can’t hurt the effectiveness of the lure. A jerk shad shape is a proven fish catcher, and the team at Halco have done a good job with the Flick Stick. I used the raw prawn and ivy flash colours during testing, and both proved to be big fish catchers. The majority of the better quality flathead fell to them. The author generally prefers natural colours when fishing for flathead. However when fish like this take your jelly prawn coloured Paddle Prawn, you can’t help but smile. 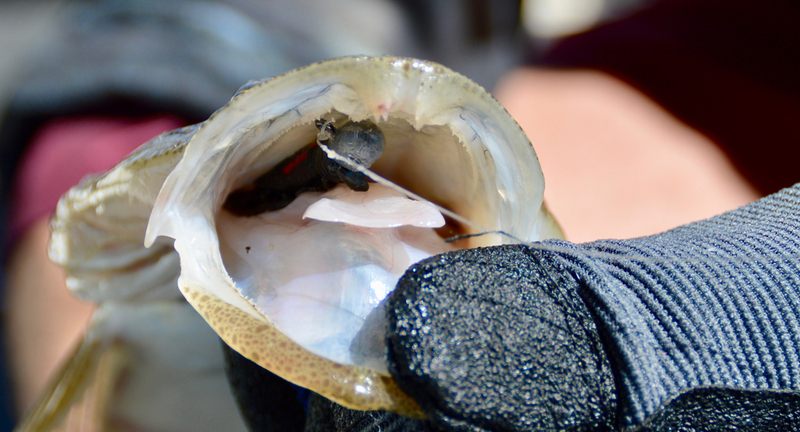 It’s always fun to get to test lures for the magazines, but it’s not always easy to find new ways in which to do it. Most of us tend to have favourite species or types of fishing we prefer. Certainly in my case, chasing flathead and our other estuary-based species is what I love. My friends and I tend to have reasonable success, and have a lot of fun doing it. Given the fact that we know how to consistently catch fish in our local waterways, I decided to set a high bar for myself and friend Nicholas Willett while testing the Madeyes. The challenge was this: five hours on our favourite waterway to catch a fish on each Madeye plastic and each colour tested, making it 10 overall. We picked favourable tides and had a crack. In total, three species and 19 fish were caught in the five hours, and we managed to get fish on all bar two of the plastics. Not to make excuses, but given slightly better wind conditions, I am pretty confident the challenge would have been achieved. The results are a great testament to how well the Madeye plastics work. You know the fish want it when they eat the plastic like this. Testing the Halco Madeye Soft Plastics has been great fun. Overall, each had the correct attributes to be successful and this was proven during the fishing challenge. Traditionally plastics made of tougher material tend to be a problematic to rig, but I didn’t find this to be the case with the Madeyes. A dab of glue on the Mad Craw was my only thing out of the ordinary, and the longevity of the plastics themselves was great, with only the paddle tail of the Paddle Prawn going a couple of times. I would love to see a few more natural colours in the range, as my preference with most of my fishing is to use natural colours, but I am sure that will be in Halco’s plans, as I believe the Madeye plastics are well and truly here to stay. To find your nearest stockist and more about the Halco Madeye soft plastics, go to www.halcotackle.com. They are well worth trying!